Based at Proseal’s headquarters in Adlington, Cheshire, the Proseal Test Kitchen offers access to a wide variety of testing machinery, allowing companies to carry out shelf-life trials and seal integrity testing in order to facilitate smooth product launches without the need to invest in their own materials and equipment. The availability of more than 15,000 trial plates and vast stores of trays and films of different materials in stock for trial samples and inspiration allows food producers to identify the most appropriate solution for their particular applications. In addition, Proseal can provide expert advice on the best packaging suppliers to use for different requirements. The ProTest machine is a universal, bench-top peel strength testing unit that quantifies the peel strength of any tray and film combination. This tells users how much force is required to peel open the film – an invaluable tool in ensuring that a pack meets the required peel-ability standards that will ensure it offers the ideal balance between customer convenience and food protection. The Test Kitchen has been designed to provide an ideal environment for food testing with excellent lighting, easy-clean surfaces, and storage for chilled and frozen products, while the increased area of the new facility means that it can now accommodate multiple users and prolonged trials. 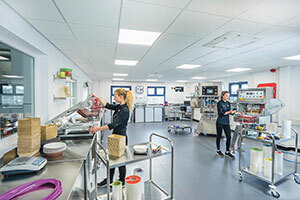 “The Test Kitchen has already benefitted lots of our suppliers and customers by allowing them to prove material compatibility, analyse film tensile strength and produce presentation samples,” explains Jessie Malone, Test Facility Manager at Proseal. This entry was posted in News and tagged Manufacturing, Testing. Bookmark the permalink.